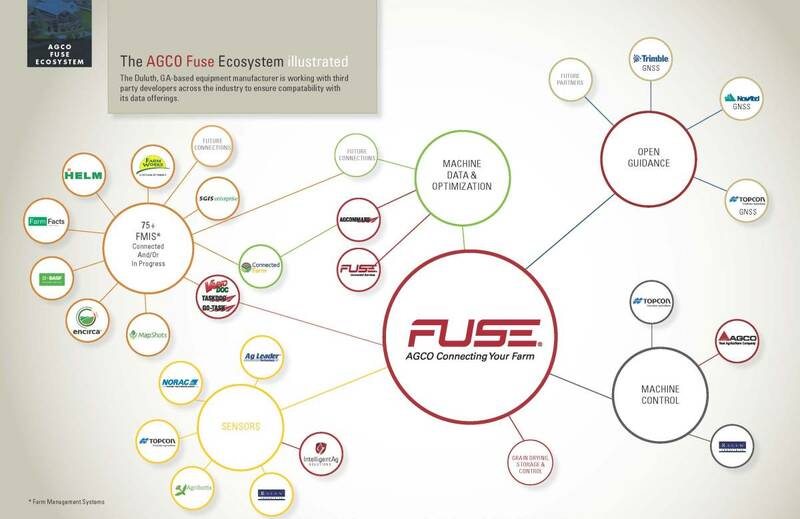 AGCO is working with third-party developers across the industry to ensure third-party compatibility with its data offerings and equipment. Click to enlarge. AGCO announces a commercial and technological partnership with Solinftec, a Brazil-based developer and distributor of digital agriculture solutions. The partnership will reportedly give AGCO customers direct access to Solinftec´s portfolio of solutions including on-board computers, weather stations, soil sensors, telemetry networks, proprietary algorithms and the real-time generation of actionable insights generating operational efficiency and agronomic efficacy. According to a joint press release from the new partners, the new solutions will launch in Brazil beginning in early 2019 for growers of sugarcane, soybean, corn and cotton and will launch in the United States for the 2020 crop cycle for corn and soybean growers. Solinftec’s offerings will complement the fleet and farm solutions already available through AGCO’s Fuse smart farming portfolio. For 11 years, Solinftec has brought solutions to its clients that capture and process data real-time and online, focusing on improving the broad operational ecosystem of a farm. Solinftec solutions are comprised of different layers of hardware, telecommunications, and software which are common across crops and regions. On top of these layers, Solinftec developed a broad suite of software and algorithmic solutions which solve challenges that are important for each specific crop and region. These solutions have substantially improved operational effectiveness and have earned Solinftec 60% of the sugarcane market in Brazil.